A few years ago I saw a video post of an 8 men crew pulling up a water skier for some distance. The average speed of current world best Rowing Times recognized by FISA is 22.5 Km/Hour or about 14 MPH for the Men’s 8+; 5:19:35 over the 2000m course. There were supposedly burst of over 24KM/Hour on that race. The men’s 8+ is the overall fastest Rowing craft. Because environmental conditions affect the rowing speed, FISA Rowing governing body recognizes Best Times and not world records. Below are the current recognized best Rowing Times as posted in Wikipedia. My day started at 5am as I headed out of Morgantown with my boat loaded on my Yukon. When I arrived in Pittsburgh, the scene was unbelievable. There were boats and crews all over the place along the Allegheny river. My registration package was ready for me when I arrived. When I got there I was welcomed as their guest. They helped me get the boat offloaded and into the water, provided all the needed instructions and sent me on my way. My racing class, the adaptives, was unbelievably well organized. The whole affair was very well run, especially considering the size of the attendance. The adaptives were allowed to launch from the Washington Landing Three Rivers Rowing Association boathouse ( what a great facility in its own right). Everyone else launches and preps from the finish area. The boathouse is close to the starting point so I did not have an exhausting row before my race. The adaptives launched 20 minutes before the posted race time, but when we arrived at the starting area there was a massive flotilla of shells awaiting their start. The pre-race meeting on the water was unbelievably friendly and cooperative. The seven adaptive rowers huddled all together to stay out of the others way as we froze in the cold breeze awaiting our start. . After 162 boats raced down the course, the adaptive rowers headed single file to the starting line. The head of the Ohio race is a running start. 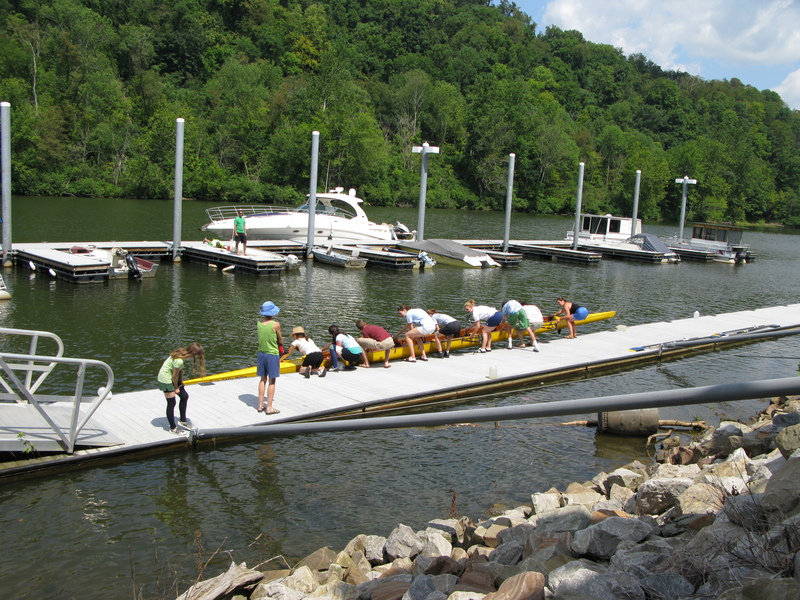 When your group is announced, you head to the starting chute down a channel of buoys; you are announced: “bow number 166 Monongahela Rowing Association you are on the course”. You have to follow the boat in front of you by less than 30 seconds or you are disqualified and allowed to race for time only. I followed 4 adaptive pairs and I was the first adaptive single. Once on the course the wind started to pick up. We were rowing into the wind. The speed was at least 15 mph and as it intensified the waves and chop did as well. The first 100 strokes went easily and the course was wide. 4 arched bridge. You have to go through the center arch or you loose points. I had been keeping the port buoy markers in my rear view mirror as I headed down the course. The 4 arched bridge put me headed for the support as I headed down the river. Fortunately I recognized it in the nick of time to avoid hitting it. I had anticipated a 500 stroke race but since I had not passed the half way point at 300 strokes I knew that the wind was significantly affecting my progress. I had hoped for a 600 stroke race and ended up catching a wicked crab about then because I lost my concentration as I got close to downtown. When you get to that point there are concrete walls on both sides of the river which affected the water flow. The markers for the end of the race are yellow buoys. I passed some yellow buoys at about 620 strokes, but I didn’t think they were the correct end of the race markers. At 700 strokes I went between two inflated yellow buoys and the horn sounded marking my completion of the 2.6 mile race. During the race I had concentrated on my competition following me making sure that I kept at least the same distance ahead of him as we were at the start. I passed no one nor did I get passed. 2.6 miles is a long race I was exhausted and dry at the end. My boat has no place to carry water so I just had to suffer. After the race we paddled slowly back to the starting line down the far side of the course. There is a special entrance creek to the Three Rivers Rowing Association boat house so at one point the Marshalls had us wait with them till the boats cleared and then we sprinted across the race course to avoid getting hit by oncoming fours. Though the 2.6 miles was intense, once the race was over I really did not want to get off the water. During the row back to the boathouse it was fun to be passed by all the fresh crews warming up on their way to the starting line. When I did get back to the boathouse the volunteers and my daughter Maddie were there to help me get my boat back on top of the car and packed up. After packing up I headed over to the main area to be part of the rest of the rowing community. I found the time sheet, found out I was the fastest in my group, and got my gold medal. Afterwards Maddie and I met up with Eric and Jim. It was a great day for a regatta: nice temperature, nice clouds, a little too rough on the water at times, and a great atmosphere. Hopefully we will have enough people to put up a team tent so we all have a place to congregate. It would also be a great way to have a personal relationship with the woman’s crew team if they joined us under the tent. Boats with covers do better with transport than uncovered boats The men’s crew team needs to be there too; someday maybe a high school team. The Head of the Ohio (HOTO) regatta is a fantastic race, it is close to us and well worth the effort. I am planning to go again next year. I hope others will as well. 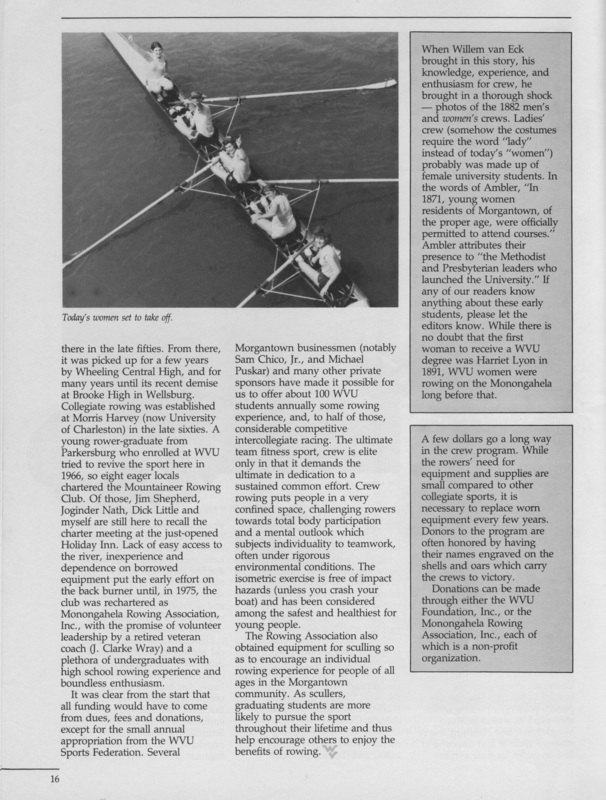 In 1975 Willem Van Eck was successful in obtaining support from the Morgantown community for the nascent Monongahela Rowing Club and in particular for the WVU Student Crew. General Woodworking located in Westover, just across the river from Stansbury Hall, was one of those business that was essential by providing a place at the edge of their lumberyard where the crew could establish a temporary storage location and then the docks. The docks required a lengthy process of approval from the Army Corps of Engineers, that lasted more than one year, including 2 public hearings. For a long time afterwards the rowing equipment was stored in old tractor trailers. At one point an old barn that served as storage burned down and MRA lost a considerable amount of equipment. But that early bunch persevered. Appeals were made to local government for support, but it would be years before ground would be broken. 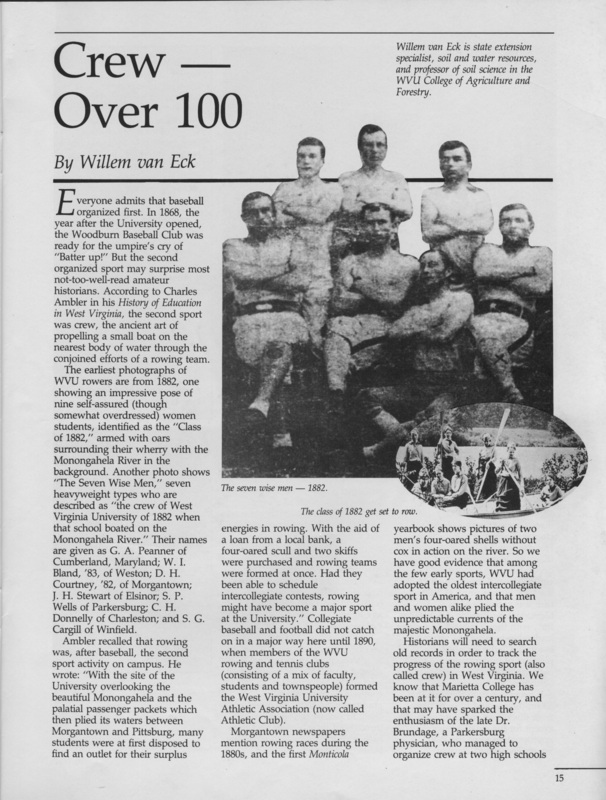 In 1990 then President Kim Stearms, a Morgantown Physician, found herself heading a fund-raising campaign for the construction of a new boathouse. The boathouse in Westover finally started taking shape in 1991 and was mostly constructed by the end of 1992. Eventually changes in the Business Landscape of Morgantown led General Woodworking to close, the property sold and MRA losing its home because it had never secured ownership to the ground in which the boathouse was located. The boathouse is now only a memory left in the minds of some of us and in the following images that detail the concept through construction of what amounted to a monumental community effort at the time.